The 1993 European Grand Prix (formally the Sega European Grand Prix) was a Formula One motor race held on 11 April 1993 at Donington Park. It was the third race of the 1993 FIA Formula One World Championship. The race was contested over 76 laps and was won by Ayrton Senna for the McLaren team, ahead of second-placed Damon Hill and third-placed Alain Prost, both driving for the Williams team. Senna's drive to victory is regarded as one of his finest, and his first lap exploits are particularly lauded, in which he passed four drivers – Michael Schumacher, Karl Wendlinger, Damon Hill and Alain Prost – to take the lead in a single lap in torrential rain conditions. The race was the first held under the European Grand Prix title since 1985, and to date is the only Formula One Grand Prix to have been held at the Donington Park circuit. After plans to hold an Asian Grand Prix at the Nippon Autopolis in Japan failed to materialise, the first European Grand Prix for eight years was run as the third race of the 1993 season. Donington Park was awarded the race, having unsuccessfully bid to host the British Grand Prix. Video game company Sega sponsored the race and the logo could be seen throughout the Grand Prix and on the podium. Sega also had naming rights to the Grand Prix. Ayrton Senna won the race for McLaren. The Williams cars were 1–2 in qualifying with Prost on pole ahead of Hill, Schumacher, Senna, Wendlinger and Michael Andretti. At the start, it was damp and Schumacher blocked Senna and both lost time and Wendlinger took third. Having dropped to fifth, Senna quickly passed Schumacher at the third corner. He then went after Wendlinger, passing him through the Craner Curves with Schumacher and Andretti trying to follow through. Schumacher went through but Andretti hit Wendlinger and both were out. Senna went after Hill now and took second at McLean's Corner. Now Prost was the target and the lead was taken at the penultimate corner – the Melbourne Hairpin. Going into the second lap, Senna led Prost, Hill, Rubens Barrichello (who had started 12th), Jean Alesi, Schumacher and JJ Lehto. The track began to dry and everyone pitted for dry tyres. Lehto was fifth, having started from the pit lane, but he retired with handling problems on lap 14. Gerhard Berger took the place but he too retired with suspension problems six laps later. The rain returned and the leaders now pitted for wets. Mark Blundell was forced off by Senna whilst battling Fittipaldi at the Esses and then spun off backwards into the gravel trap whilst attempting to rejoin the track surface. Schumacher stayed out and was leading but soon spun out by lap 23 as a result of being on the wrong tyres. The track began to dry and everyone pitted once again with Senna having a problem and losing 20 seconds. Prost now led Senna, Hill, Barrichello, Derek Warwick and Johnny Herbert. It began to rain and the two Williams stopped for wets while Senna stayed out. It was the correct decision because it began to dry again. The Williams stopped yet again for dries. Prost stalled in the pits in his stop and when he rejoined, he was a lap behind and down in fourth. Barrichello was now second but it rained and then stopped again. He went to the pits twice and by now Hill was in second, albeit a lap down. Barrichello, third, had trouble with his fuel pressure and retired, giving the place to Prost. Senna set the fastest lap on lap 57, on a lap when he drove into the pit lane but aborted the pit stop, showing that there actually was a shortcut through the pit lane. This is due to the Grand Prix configuration of Donington, which has the pit entry before the final hairpin corner onto the start/finish straight. This is possibly the only fastest lap in modern F1 history set by driving through the pit lane. Senna won from Hill and Prost, having made four pit stops in the wet-dry conditions compared to Prost's seven, which is a record that stands as of 2018. [clarification needed][citation needed] Herbert finished fourth for Lotus by stopping only once while all the other finishing drivers stopped in the pits several times. Riccardo Patrese and Fabrizio Barbazza completed the top six. By the end, Senna had lapped the entire field except for Hill, who finished over a minute behind. At the end of the race, Senna was led onto a podium and was given a trophy that depicted Sega's mascot, Sonic the Hedgehog holding a trophy with the Sega logo underneath. A widely circulated image on the internet shows Senna holding the trophy. Contrary to popular belief, this is not the award Senna got for winning the Grand Prix but a fake trophy for a photo op. Video footage shows that after having the photograph taken, he was given the actual award, a trophy that does not depict either Sonic the Hedgehog or the Sega logo. As of 2018, McLaren currently is still in possession of the famous Sega trophy, although the exact location of the trophy is unknown. For a long time, the trophy was thought to have been lost until McLaren's official Twitter account revealed that the trophy is currently placed inside one of their storerooms. 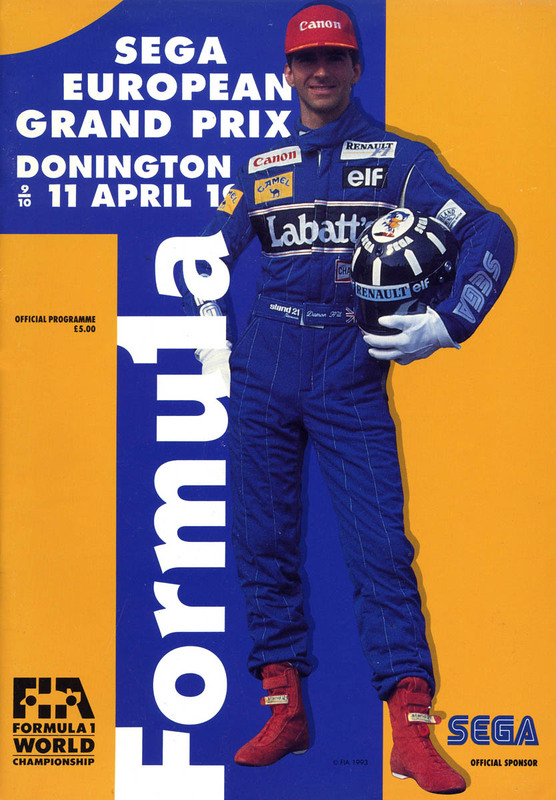 ^ "Motor Racing Programme Covers: 1993". The Programme Covers Project. Retrieved 29 October 2017. ^ a b "1993 European Grand Prix". formula1.com. Archived from the original on 29 November 2014. Retrieved 23 December 2015. ^ Harmer, Alex (1 May 2013). "Ayrton Senna's greatest drives". Motor Sport magazine. Archived from the original on 22 December 2015. Retrieved 19 September 2013. ^ Walker, Murray (11 April 2013). "Murray's memories: European GP 1993 – Sensational Senna". BBC Sport. Archived from the original on 9 March 2014. Retrieved 19 September 2013. ^ "Greatest single lap in F1 history was driven at Donington's first and last grand prix". Nottingham Post. 10 June 2011. Archived from the original on 29 November 2014. Retrieved 19 September 2013. ^ a b Medland, Chris (24 June 2011). "Senna reigns supreme". ESPN. Archived from the original on November 29, 2014. Retrieved 19 September 2013. ^ a b c d e Plunkett, Luke (23 December 2012). "The Day a Sporting Legend Became an Unwitting Sonic the Hedgehog Icon". Kotaku.com. Archived from the original on 3 September 2015. ^ a b "High End Sonic the Hedgehog Merchandise". sonicgear.org. Archived from the original on 16 January 2016. ^ McFerran, Damien (12 April 2018). "Random: The Legendary Sonic Formula One Trophy Won By Ayrton Senna Still Exists". Nintendo Life. Retrieved 15 June 2018. ^ a b "Europe 1993 - Championship • STATS F1". www.statsf1.com. Retrieved 15 March 2019. Henry, Alan (1993). AUTOCOURSE 1993–94. Hazleton Publishing. ISBN 1-874557-15-2. Wikimedia Commons has media related to 1993 European Grand Prix.